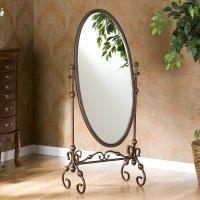 We love this mirror!! The Holly & Martin Tuscan Iron Cheval Full Length Floor Mirror features exquisite antique styling wrapped in a burnished bronze finish. This gorgeous cheval mirror has long been a customer favorite and is perfect anywhere from the living room to the bedroom. The function of such a wonderful piece is a welcome addition to any room. Great Mother's Day gift idea. For more details visit www.cheapchicdecor.com.